In most parts of the country (especially here in the Northeast), winter isn’t a time that’s synonymous with the best time to get outside and explore. We long for warm summer or brisk fall days where we can enjoy all the natural beauty, and a grayer, leafless landscape often doesn’t appeal. But to slough off the outdoors for a third of the year is to our detriment: spending time outside in nature is one of the best ways we can bond as a family! 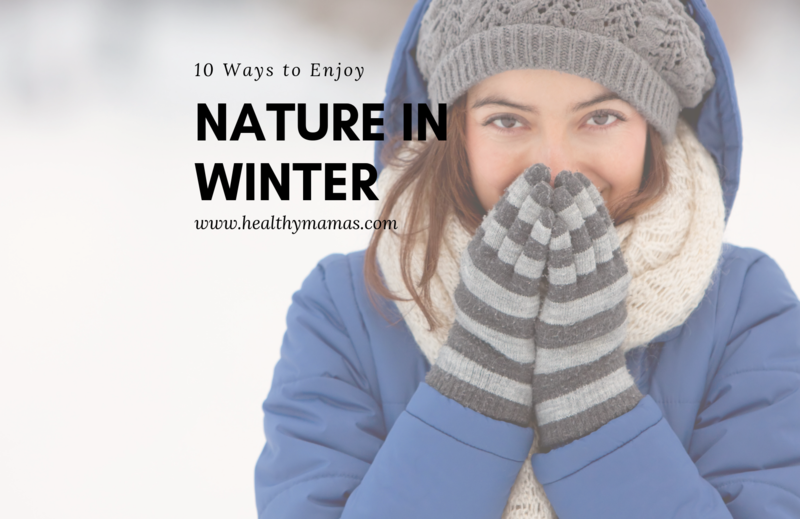 Plus, winter brings with it more natural beauty than a lot of us recognize, especially for kids who are often less affected by the cold temps. It’s important not to give into the siren of screen time just because it’s chilly outside. Studies have shown when children are immersed in nature, they have enhanced mental and physical health, including marked improvements in problem solving, mental cognition, patience and attention. Nature also promotes creativity and resilience, encouraging more imaginative play. It will come as no surprise that study after study shows that each year, the time we spend consuming media creeps up and our time outside goes down. Structured activities and urban sprawl have given way to a literal dearth of time and space to enjoy nature. But there are ways to get back in touch with nature, even during nature’s coldest days. These are great for fitness and give everyone a chance to be in touch with the quiet of the landscape around them. They can be done almost anywhere with minimal training and the snow on the ground becomes an asset, not a hindrance. Even babies can participate, if they’re strapped securely into a hiking carrier. Sledding is one of those activities we do “for the kids,” and the next minute, the adults are whizzing down and leaving their younger counterparts in the dusty. Sleds are inexpensive and sledding hills are plentiful. The climb up and down provides a great opportunity for burning off some energy, and the slide down gives you a chance to get those endorphins going. With the right precautions, outdoor skating on a pond can be a magical experience for the whole family, but indoor and outdoor rinks abound as well. Skates are inexpensive to buy used or rent, and with a milk crate for balance it’s easy to teach even the younger set to get moving on the ice. Bundle up on a cold day and hit your favorite hiking trail. Winter brings with it a whole new ecosystem that you likely haven’t seen in your warmer hikes. We love using a fun scavenger hunt to keep reluctant family members motivated on hikes. Write a simple list of “things to find” and offer a prize to the family member who finds everything first or do it together! Or, print a done-for-you activity sheet from here or here. This is a great activity to get your creative juices flowing. Hunt around the house for items to decorate your snowman (for extra delight, pull out the food coloring to dye the snow!) and create snowmen. Work as a team, let your creativity shine and get a chance to play outside with your hands–a perfect afternoon! For something a little more structured, search for a Tinkergarten class in your area. These classes allow children to explore and collaborate, using the outdoors and nature as the classroom. If your kids have a competitive spirit (and don’t mind a bit of snow to the face), a snowball fight is the perfect thing. For older kids, this is a great chance to “get” parents, and to practice hand-eye coordination for the little ones. Create ice cubes of different shapes and colors (use food dye) in your freezer, then bring them outdoors to the snow or cold weather to create ice sculptures. It’s just like building blocks inside with a fun twist–“Frozen” meets Legos. We tend to reserve bonfires and s’mores for summertime, but this is a perfect winter bonding activity on the right night (with all the correct safety precautions, of course!). Stay warm with a fire and hot chocolate and breathe in the cold night air. Mix food dye and water in spray bottles to create your very own snow paint. Go outside and start painting the snow–also a great way to add some color to your snowmen! Of course, getting the most out of winter with kids in part depends on your kids feeling warm and toasty. Layers are key! There are some great ideas for layering up your little ones for winter in this article.